Many people carry smartphones or smart gadgets in their pockets but what if you wear smart pants that stores power? Most Scientists have been working on smart clothing and flexible circuits, sensors and screens leaving behind power. Clipping a chunky lithium-ion battery in your pants seems weird. That’s why engineers at Drexel University and the US Naval Academy have devised a way to create knitted fabric that can store power. Related Article: PoWiFi – What if you could charge your phone via WiFi? The key to this advancement is integrating carbon atoms into different types of yarn, which can then be used to make clothing. Most current attempts at smart clothing have external power and processing. It’s really just the sensors that are embedded. This supercapacitor material could be used to provide power to smart garments bristling with sensors or touchscreens without the added bulk of a separate battery pack. Fabric-like materials capable of storing power have been demonstrated in the past, but they tend to be very expensive and rely on material that’s difficult to handle. A project from a team of US and Chinese researchers last year accomplished this with graphene and carbon nanotubes. The activated carbon used in the new Drexel was embedded in the fabric with a process called natural fiber welding (NFW). This technique involves coating a cellulose-based yarn made from cotton, linen, bamboo or viscose with an ionic liquid. This allows carbon atoms to bind the structure. It’s a multistep process, but the team was able to build a NFW machine that spits out carbon yarn by the meter. Extreme Tech provides that the cost of ionic liquids in the NFW are the most expensive part of the production process. If there is demand for this material, that would be the limiting factor in scaling up to an industrial scale. The amount of power fabric made from this yark can store is not high, certainly nowhere near lithium-ion batteries of the same volume. 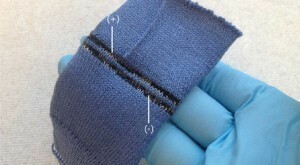 A sheet of fabric supercapacitor about the size of the back panel of a sweater (3000 square cm) could store the same power as a small coin cell battery. Garments made from this material would need their own energy harvesting technology, perhaps based on body heat or movement. If you can continually replenish the charge in the superconductor fabric, you could power an array of low-power electronics. Many people always complain when there is a blackout or when their phones run out of charge. Electricity is now a necessity in Kenya just like food but Kenyans never appreciate the availability of other power sources like solar or the use of batteries hence I believe power stored in pants can go a great way to revolutionize power storage.